Kanapitsa Mare Hotel is equipped with standard double rooms sea view and "mountain view". All rooms feature FLAT screen TV sets. Sapphire waters, emerald pine trees and topaz blue skies are just a few of the images that come to mind when one thinks of Kanapitsa Mare Hotel. Ideally situated on a picturesque pine and olive hillside and above the magnificent sandy beach of Tzaneria (approximately 200 meters away) in the Kanapitsa peninsula, it offers spectacular panoramic sea-view from all rooms (select rooms offer mountain view) and lounges. Kanapitsa Mare Hotel is a family run hotel, designed to offer a great, relaxing holiday experience to all visitors of Skiathos during their stay. Within our hotel, guests can enjoy friendly service, WI-FI internet access, a fully stocked pool bar, various snacks served by the pool, top views and much more. 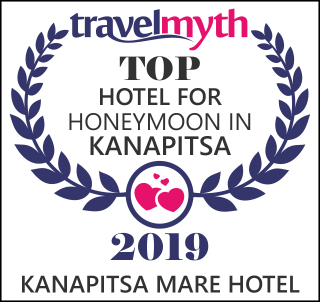 If you are considering to get married in Skiathos (or to renew your wedding vows) Kanapitsa Mare Hotel is the ideal, romantic spot in Skiathos. We look forward to welcoming you in Kanapitsa Mare Hotel for memorable, relaxing Skiathos Holidays. Welcome to Lithos Bar of Skiathos; Cocktails, Snacks, Friends! !..